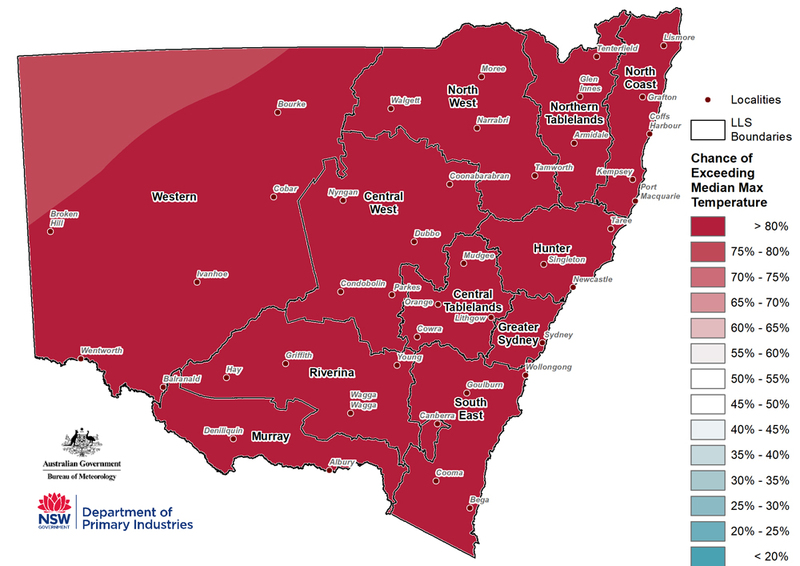 Drought conditions are being experienced across most of NSW with 100%* of the state in one of three drought categories. The latest estimate of drought intensity at the end of July 2018 places up to 48% of the state as Drought Affected, 37% in Drought and 15% in Intense Drought. The dry conditions that were reported in June have extended through July, with limited rainfall recorded across NSW this month. The drought has persisted in some regions since October 2017, with the event duration now ranging from 6 to 12 months. * Figures are rounded up to the nearest one decimal point as per the standard convention. A number of Local Land Services (LLS) regions are currently experiencing the most severe category of Intense Drought. This includes parts of Western, North West, Central West, Central Tablelands, South East, Hunter, Greater Sydney and Northern Tablelands LLS regions. This means that these regions are experiencing a more acute rainfall deficit as measured by climate monitoring stations, although it is important to recognise that very poor agronomic (field) conditions are being experienced across a much wider area of the state. 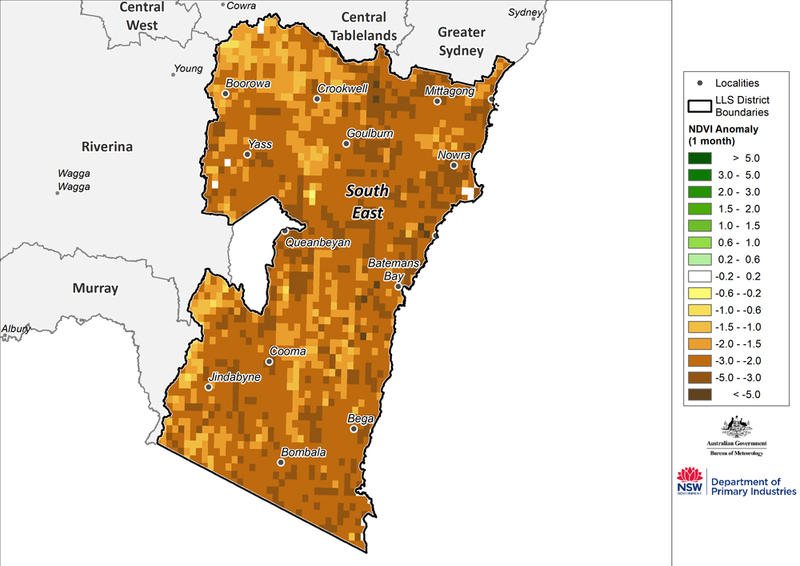 Based on available agronomic drought indicators, remote sensing and field reports, current in-field conditions are very poor over vast areas of NSW. There are very low levels of soil moisture, poor pasture and crop production and in some areas total grazing pressure is providing additional stress. There are some isolated pockets which are experiencing slightly better conditions, such as the southern alpine zone, the greater Hilltops (Young) region and parts of the south and north coast. 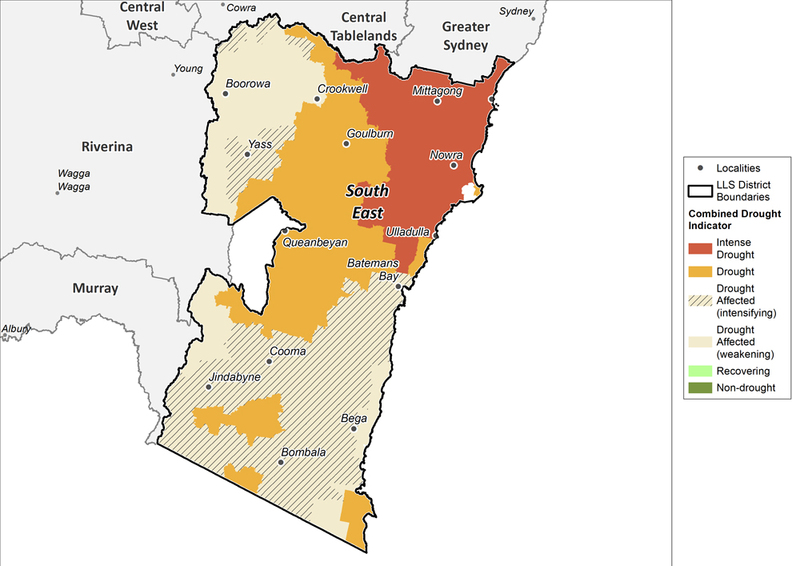 Despite pasture and soil moisture conditions in the North Coast being better than other regions of NSW, drought indicators show that parts of this region are drying off, and potentially in the early onset stage of a drought event. DPI’s conservative assessment is that this area is now Drought Affected. Areas that received late sowing opportunities in the South of NSW in June 2018 received limited rainfall over the July period. These crops are now at higher risk of failure, or have lower yield potential. Producers are faced with a difficult decision to graze sown crops or rely on rainfall in August-September to increase yield potential. As reported in June, the dryland winter crop season in Northern NSW has been limited by low rainfall and soil moisture, with a very small area sown in 2018. For livestock farming, a defining feature of the current drought event is the impact on pasture production, with the widespread failure of the 2018 autumn growing season now extending well into the winter period. Significant feed-gaps are being managed across the State as the drought duration lengthens. Even if significant rainfall were to occur in the coming August-September, producers are faced with a late start to the Spring production window to allow time for full recovery of the pasture base. This means planning for another 2-3 months of feeding as a possible best-case forward scenario. The worst case forward scenario is for limited rainfall to occur over New South Wales in the coming three months. Guidance from the latest Australian climate models suggest this is the more likely outcome, with the official forecasts highlighting an increased probability of the warm and dry conditions continuing. If this were to eventuate the current livestock feed-gap would continue for at least 3-6 months, and pressure on the State’s water storages would build. Australian forecasting services have the region on an El Niño Watch, with a 50% chance of an El Niño developing in spring 2018. El Niño conditions are associated with below average rainfall in south eastern Australia. It is important to recognise the CDI provides an aggregated view of the State, and that on-ground conditions can be different to those displayed in the maps. They provide an ‘on average’ view of a particular region only and are based on indicators. To report local conditions use DPI FarmTracker. 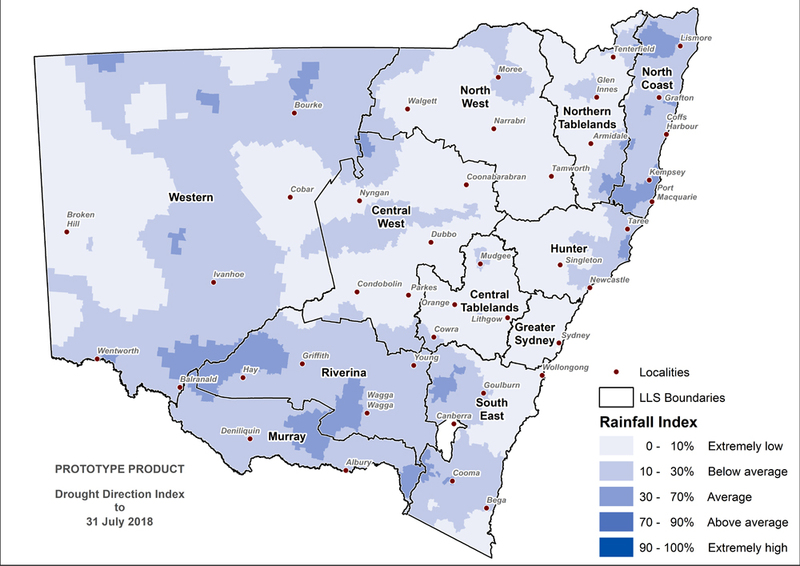 Rainfall totals were average to very much below average across most of NSW in July, with isolated areas in the Central West, West and North West recording their lowest on record falls for the month. Only 0-10mm were recorded in the Western, North West and Central areas of the state, including Greater Sydney and parts of the South Coast. Falls of up to 100mm occurred in parts of the North Coast, Northern Tablelands, and an area to the south of the state, with the highest falls occurring in the alpine areas. The monthly NDVI anomaly (Figure 3) indicates lower than normal greenness extended across NSW during July. These values are indicative of very poor agronomic conditions where crops and pastures are under significant stress. Some areas in NSW have seen a slight improvement in the NDVI anomaly this month, but these are relatively small and isolated, for example the area from Cowra to Young, or north east of Singleton. A region east to north east of Bourke through to Brewarrina is showing a vegetation (greening) response to a late June rainfall event– but it is important to consider total grazing pressure and follow up rainfall when assessing the extent to which this is a recovery from the drought conditions experienced in this region. Most of NSW experienced average daytime temperatures between 12 -24°C (Figure 4). 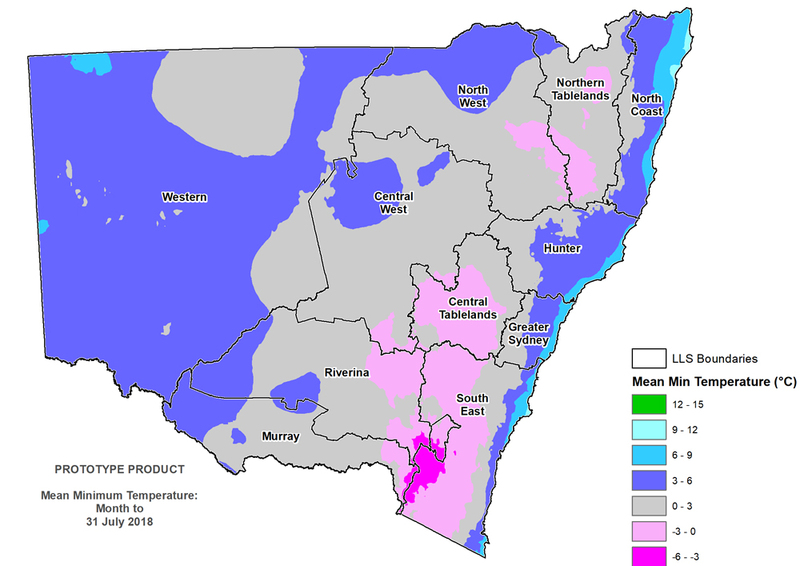 Parts of the Central Tablelands, South East, Hunter, Riverina and Murray Local Land Services regions recorded average daytime temperatures between 6-12°C and alpine regions recording daytime temperatures between 0-9°C. Overnight temperatures averaged between -3 to 12°C across most of NSW, with alpine regions averaging between -6- to -3°C (Figure 5). Severe frost events occurred in July 2018 in the Tablelands, with temperatures as low as -6 reported in official climate stations. For some pasture species this sets up a physiological response where no growth will occur until the spring break. The Rainfall Index (RI, Figure 6) shows that the majority of NSW continues to be experiencing below average to extremely low rainfall. There are some parts of the state that are at the lower end of the average range of Rainfall Index, including parts of Western, Riverina, Murray, South East, and North Coast Local Land Services regions. Available field reports highlight that these areas have received isolated falls of rain over the past month, and that it has been highly variable within these zones. 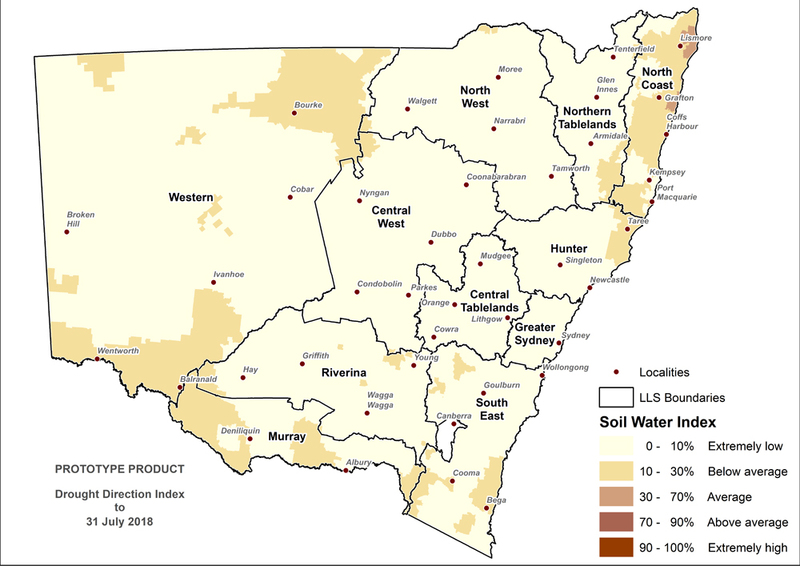 The Soil Water Index (SWI, Figure 7) shows that stored soil moisture is below average to extremely low across NSW. The widespread deficit represented by the SWI reflects the on-ground conditions that have been reported to NSW DPI over the past few months. This also raises longer term concerns about likely storage levels available for the next summer cropping season, with drier catchments requiring more substantial rainfall to trigger runoff into storages. The Plant Growth Index (PGI, Figure 8) is below average to extremely low across NSW and largely mirrors the Soil Water Index (SWI). The SWI and PGI are key indicators of the agronomic drought that is currently being experienced across NSW, and provide a closer estimate of the spatial extent and variation in field conditions than the Rainfall Index at this stage of the drought event. 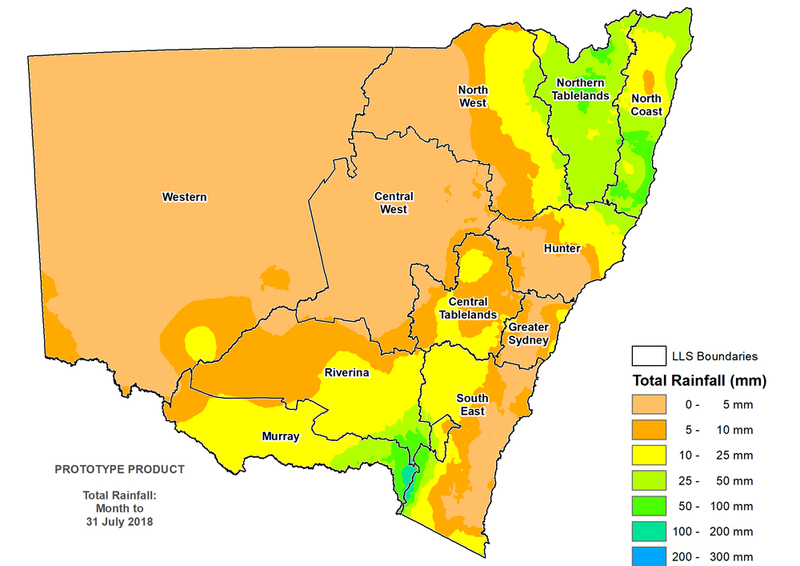 The Drought Direction Index (DDI, Figure 9) indicates that a drying trend is occurring over the majority of NSW. Parts of Murray, Riverina, South East and Western Local Land Services regions are displaying a wetter trend, due to rainfall in these parts over the past 200 days, however this does not constitute the end to the drought event. Changes in the individual drought indicators may have occurred since this update was released. For the most current information, please visit the latest drought maps at DroughtHub. Figure 10 displays the CDI status for each individual Local Land Services region to 31 July 2018. Drought conditions continue across the Murray and Riverina Local Land Services (LLS) regions, although much of the region remains in the Drought Affected category, having received low to moderate falls of rain over the past two months (Figure 11). The Combined Drought Indicator (CDI) has an area to the west in the more severe Drought category. The agronomic indicators (Soil Moisture and Plant Growth) have been below the drought threshold since June 2018, signifying limited effectiveness of rainfall in this region. There are small isolated areas that are currently in the Recovery or Non-Drought categories to the far east, in the Alpine Zone. 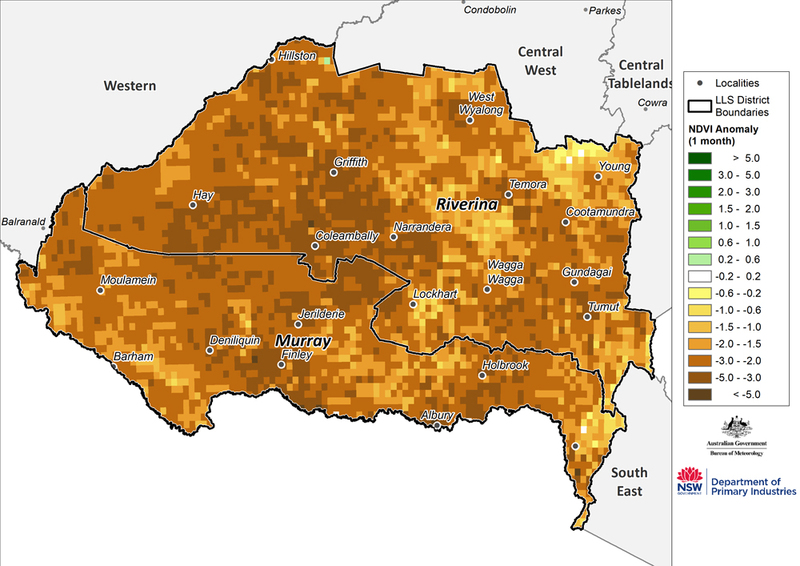 The monthly NDVI anomaly (Figure 12) indicates some significant variation in field condition with isolated areas of the Riverina and Murray having a greening response. This is likely a mixture of a green canopy in winter active pastures and where cereal crops have germinated. Examples include the region from Wagga to Temora and north of Young, where field reports from DPI FarmTracker were available to verify this response, highlighting green active vegetation with low biomass. The NDVI data provides an insight into the complex variability that can occur in the landscape under drought conditions, whereas the parish level CDI simplifies this variability as one category ‘Drought Affected’. The drought indicators for Hay (Figure 13) highlight that the drought event has intensified in this region over the past two months, transitioning from Drought Affected to Drought. Notably the agronomic indicators are significantly lower than the Rainfall Index over this period, highlighting that the effectiveness of rainfall is driving a feed-gap and poor dryland cropping conditions. Like much of NSW, the Hay district experienced a drying event in October 2017, but did receive some reasonable falls of rain over the summer. It has been in the Drought Affected category for some time, with the event intensifying over June and July 2018. The entire Western LLS region is experiencing a drought event, although there is considerable spatial variability in the current level of intensity and associated field conditions across this large region. Based on available data, the region from Broken Hill north to Tibooburra is experiencing Intense Drought, with a larger area under Drought (Figure 14). 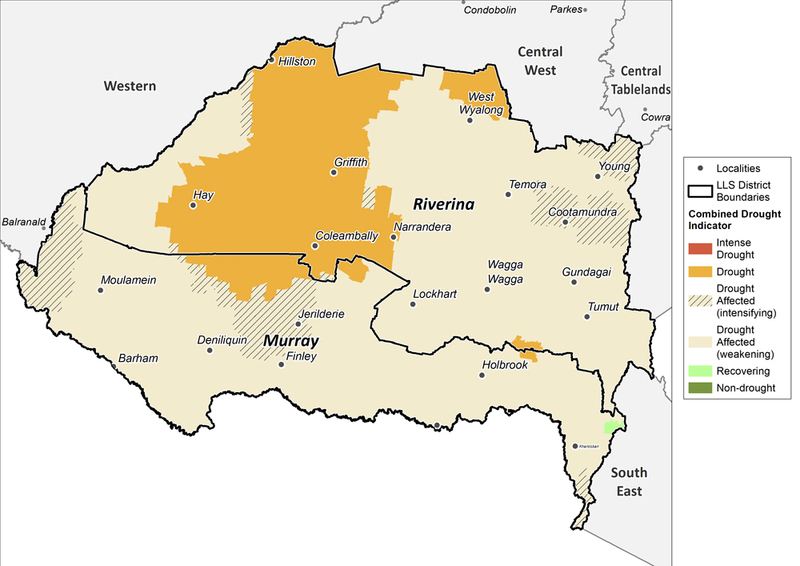 Intense Drought is also identified by the CDI north east of Wanaaning and the greater Cobar region. Elsewhere the Western LLS is categorised as Drought Affected. The CDI classification simplifies a complex pattern of field conditions, drivers and timing of this drought event. The monthly NDVI anomaly (Figure 15) indicates that the Intense Drought and Drought areas broadly correspond to regions that have very low greenness in July 2018, indicative of bare soil or minimal ground cover. There is considerable variability in the Drought Affected zone, where isolated falls of rain have occurred over the past two months or more. A good example is the region around Brewarrina which received significant rainfall in late June and is now having a greening response. It is important to recognise that while this could be the early stages of recovery, without follow up rainfall there is potential for the drought event to re-intensify. DPIs conservative classification of this sequence of climatic events is that the region around Brewarrina remains Drought Affected. This also reflects available field reports for the region. 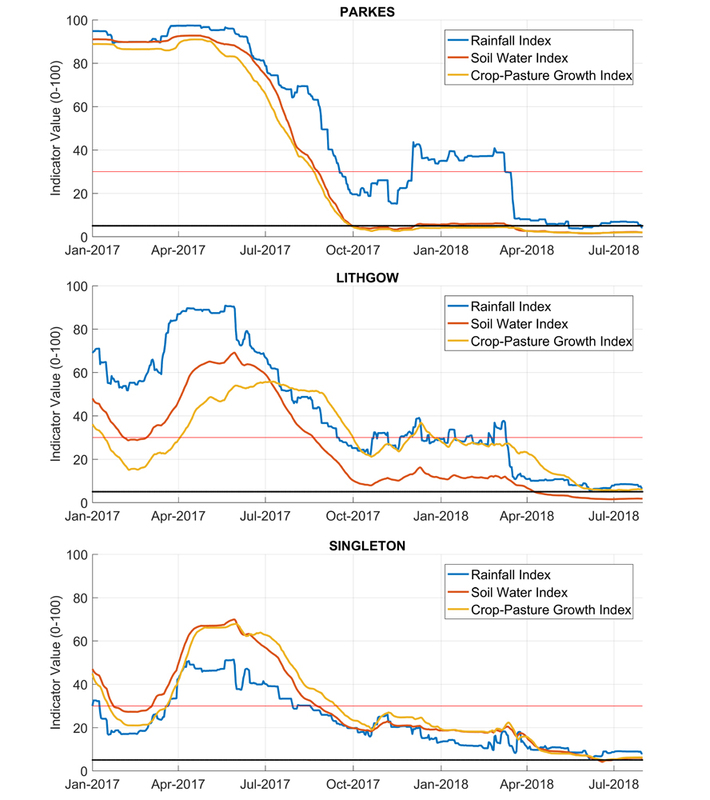 The time series of drought indicators in Figure 16 for Bourke, Broken Hill and Ivanhoe highlight differences in the progression of the drought event across the region, and the significant on-ground variability that producers are managing. In all these districts there was a significant drying in October 2017, with both Bourke and Ivanhoe receiving rainfall in the summer and experiencing a mild recovery, but remaining Drought Affected. Conditions, particularly those tracked by the agronomic indicators (soil water and plant growth) have remained under stress throughout the 2018 Autumn until July 2018. 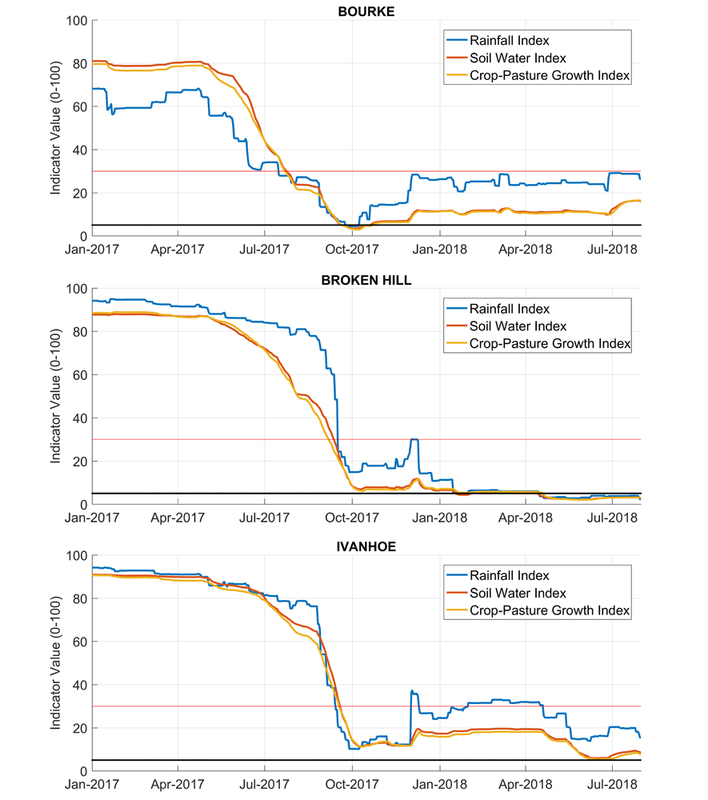 In contrast, Broken Hill has received little rainfall since October 2017, with the indices at very low levels throughout this period. Importantly, factors like total grazing pressure and limitations of the sparse rainfall monitoring network to capture the full spatial variability of summer rainfall need to be considered for this region. The CDI accounts for these factors by classifying the region as Drought Affected, as a minimum. It is important to recognise that the duration of the drought event for the region as a whole is from October 2017 continuing right through to 31 July 2018, despite some localised summer rainfall and pasture response in the 2018 summer. Reasonable falls of rainfall occurred in the Northern Tablelands and North Coast region in July 2018, but the agronomic response of the landscape to these events was not significant and the region’s drought state remained largely unchanged. The Combined Drought Indicator (to 31 July 2018; Figure 17) establishes that the entire region is in one of the three Drought categories. Areas around Walgett and to the east of Baradine have entered the Intense Drought category, with areas between Glen Innes and Tenterfield now in the Drought category. The North Coast has dried off relative to normal conditions for the region (excluding the coastal fringes) and is potentially in the early phase of a drought event. This is classified by the CDI as Drought Affected, but it is a conservative estimate with the drought indices only just below the threshold (30th percentile level). The monthly NDVI anomaly (Figure 17) indicates that the lowest levels of greenness in July, largely correspond to those mapped by the CDI in the Intense Drought category. This is indicative of bare soil, very low levels of ground cover and forage available for livestock. Elsewhere there are patches of greening response, driven in part by isolated light rainfall events. 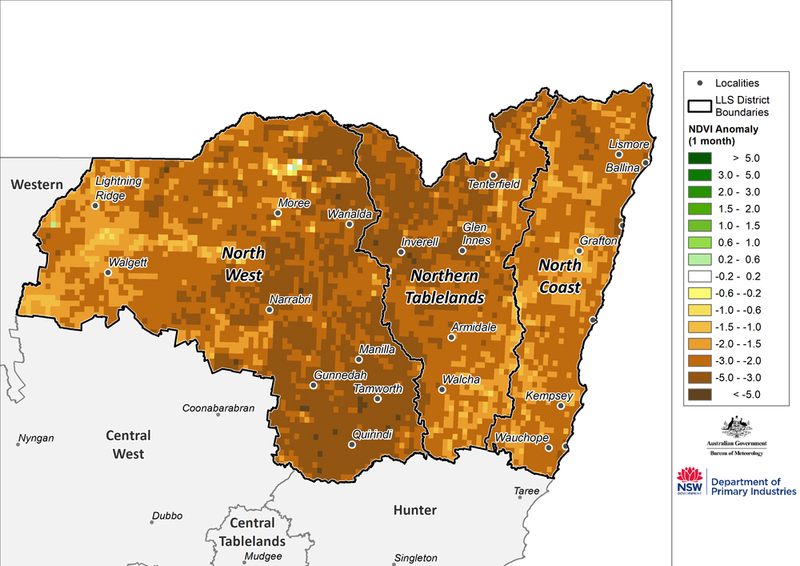 The rainfall events that occurred in July across the Northern Tablelands are not reflected in the NDVI response, but are likely to be seen in the August data. Importantly, isolated areas of greening in the North Western LLS can reflect the establishment of irrigated crops, so cautious interpretation is needed. The time series of drought indicators for districts in Northern NSW (Figure 19, Walgett, Tenterfield and Grafton) establish a general pattern of the progression of drought over time, but with localised differences in the severity of this event. All regions experienced a drying off in October 2017, with some falls of rain in the summer, and recent drying since May-June 2018. However the Walgett district has experienced a more severe event, being Drought Affected across this period and transitioning into Intense Drought during autumn-winter 2018. This pattern and intensity reflects field reports that have been provided to DPI since May 2018. 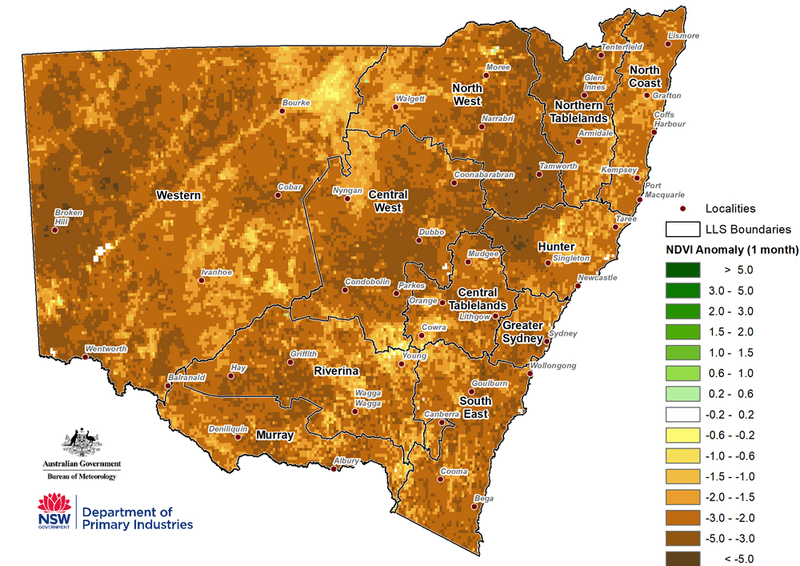 Tenterfield experienced higher rainfall over the summer period and while conservatively classified as Drought Affected for much of that time, the event has only recently intensified. In contrast Grafton received significant summer rainfall, and only recently transitioned into the Drought Affected category. 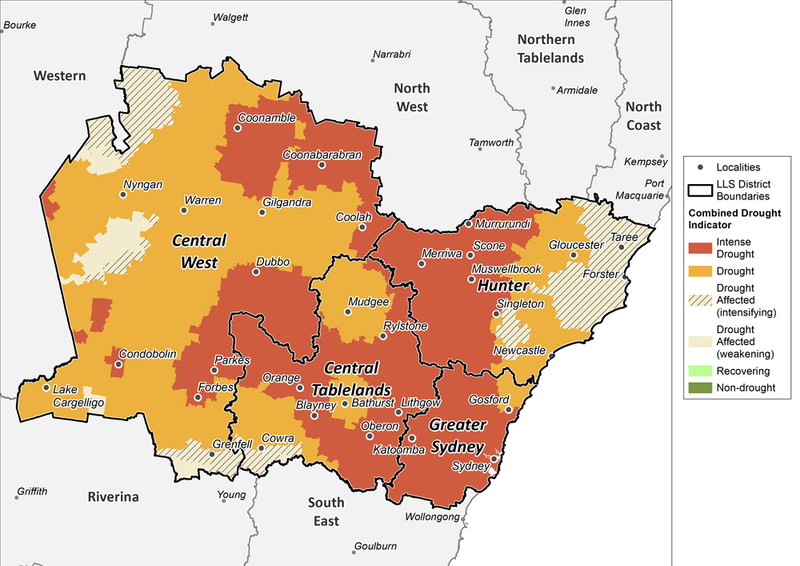 Drought conditions continue across the Central Tablelands, Central West, Hunter and Greater Sydney Local Land Services (LLS) regions. The Combined Drought Indicator (to 31 July 2018; Figure 20) places the majority of the region in the Drought or Intense Drought categories. The area mapped as Intense Drought by the CDI broadly correspond to the parts of the landscape that have very low levels of greenness in the July NDVI map (Figure 21). This indicates low levels of pasture cover, in some areas bare soil, and low fodder availability for livestock. 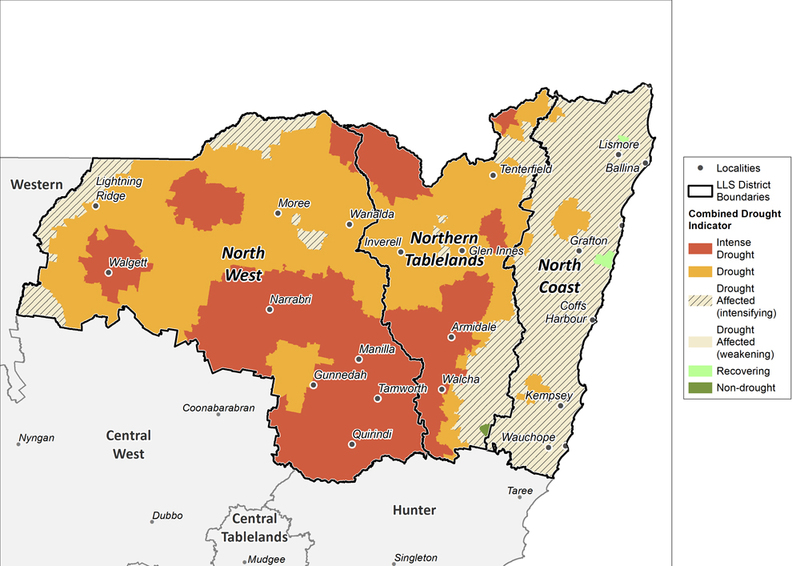 There have been isolated falls of rain in parts of the Central West and Central Tablelands, but these falls have not triggered a sufficient response in pasture for agronomic recovery from drought, and much of the region remains in the Drought category. There have been significant falls of rain on the coastal fringe of the Hunter region through to as far as Singleton. West of Singleton the area is in Intense Drought and has been for much of 2017-18. 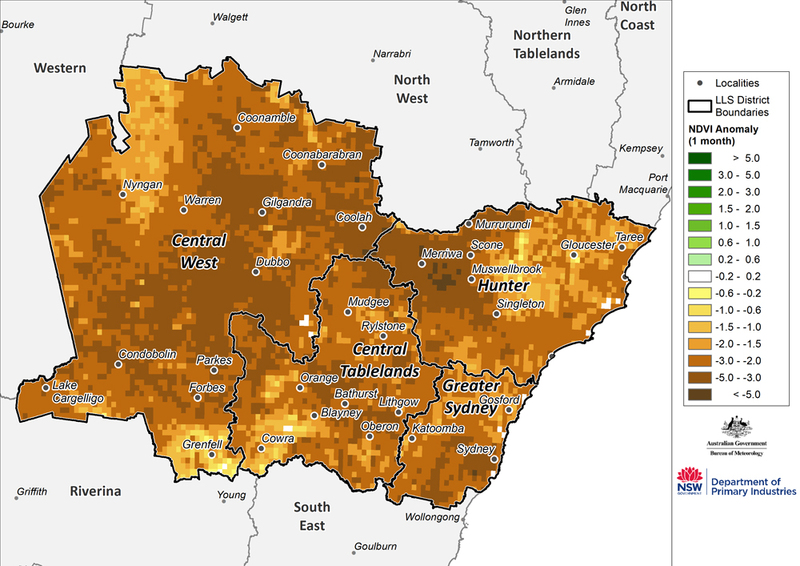 The CDI is configured to weight the worst conditions higher when classifying the drought status of NSW Parishes, so the full impact of coastal rainfall is not reflected in the drought maps. The time series of district drought indicators (Figure 22, Parkes, Lithgow and Singleton) highlight the importance of assessing the agronomic aspects of seasonal climate, as opposed to rainfall alone. 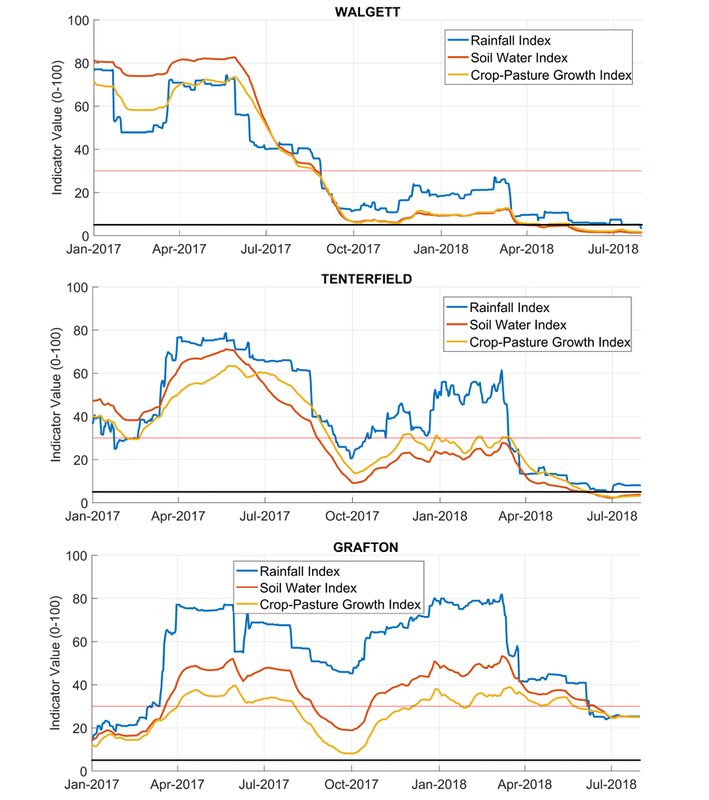 The series at Parkes is an example of where the Rainfall Index is well above the drought thresholds, but soil moisture and pasture-crop growth are extremely low relative to historical benchmarks for the region. The example of conditions at Parkes is typical of those experienced throughout the Central West, where producers have been managing a prolonged feed-gap since the latter half of 2017. This aligns with field reports made available to DPI throughout that period. The time series from Lithgow and Singleton reflect a similar progression of the drought event. 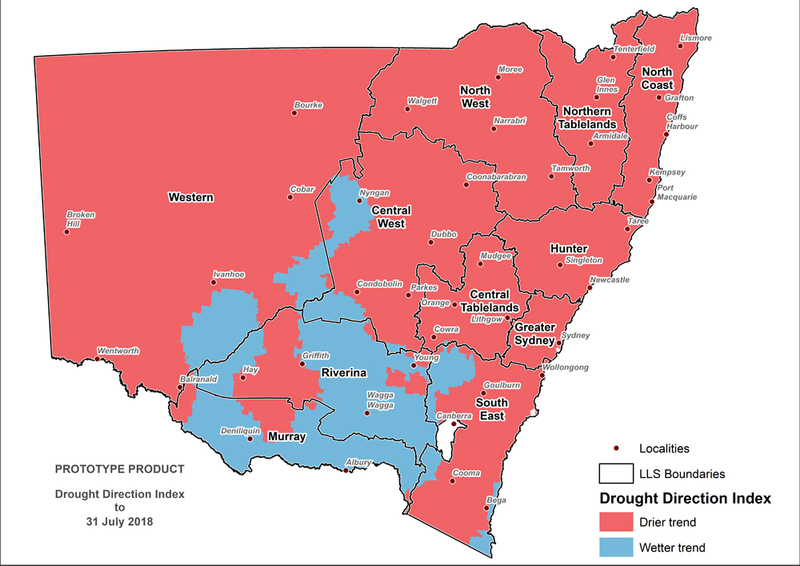 The South East LLS region is experiencing drought conditions, with the landscape classed into the Intense drought category in the greater Mittagong area and Drought in the region from Crookwell through the Molonglo to north of Cooma (Figure 23). Elsewhere the region is classed as Drought Affected. This classification simplifies the local variation identified by the remote sensing-NDVI data (Figure 24), with some areas of greenness evident across the region, for example north-west of Boorowa. There are very low NDVI values for July in the Intense Drought regions, indicative of low pasture residuals. 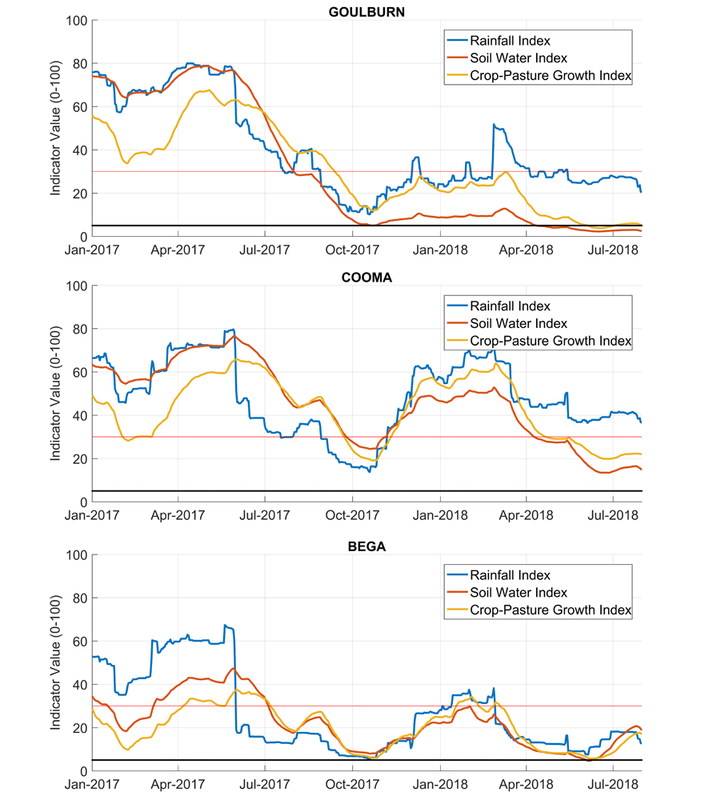 The district time series of drought indices (Figure 25, Goulburn, Cooma, Bega) identify the recent intensification of the drought even following a dry 2017-18. 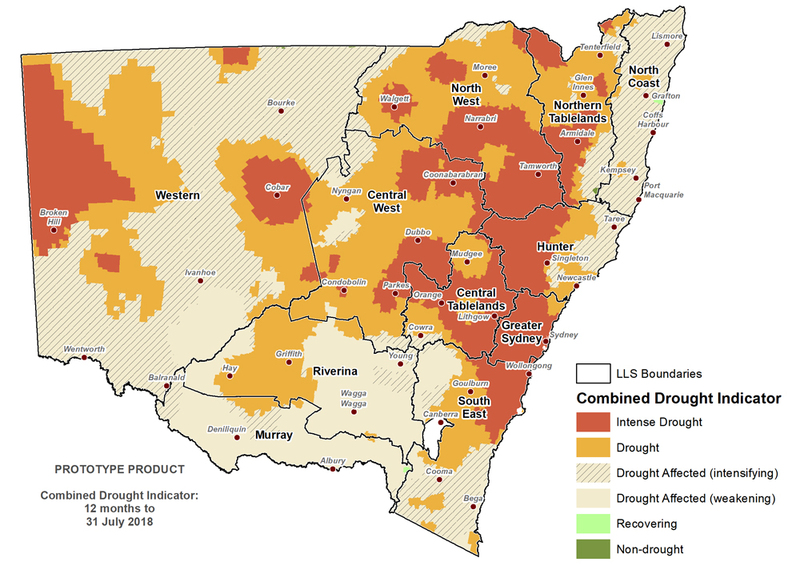 The indicators are not as low, or the same level of drought intensity, experienced elsewhere in NSW. 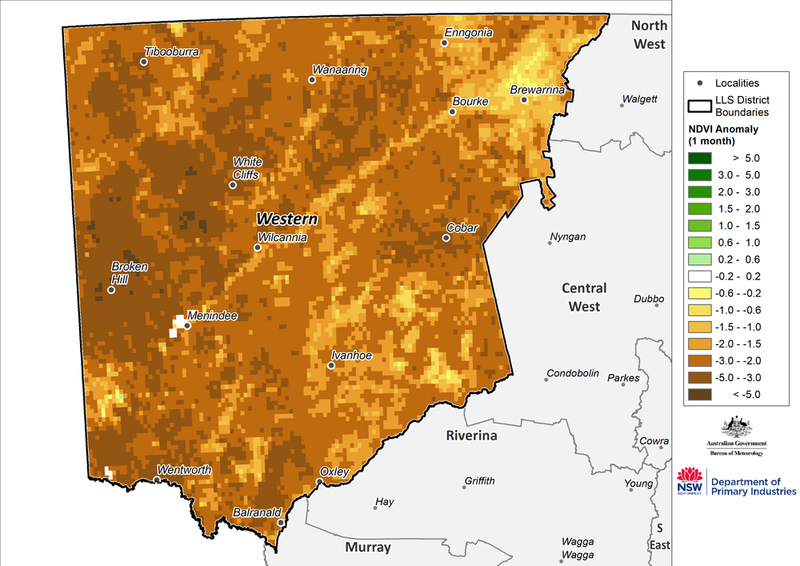 Cooma, for example, has only recently transitioned into the Drought Affected category over the last three months. The official national climate outlook for August to October was issued by the Bureau of Meteorology on 26 July 2018. The outlook shows that most of mainland Australia is likely to be drier than average over the next three months. August to October daytime temperatures have an increased likelihood of being warmer than average across Australia. Overnight temperatures also have an increased likelihood of being warmer than average across Australia, except for parts of far north Queensland which have a near equal chance of cooler or warmer than average overnight temperatures. For New South Wales, the rainfall outlook (Figure 26) for August to October indicates that there is an increased chance of drier than normal conditions over the next three months across the majority of the state. The only exception is the far north east which has a near-equal chance of a wetter or drier than average three months. 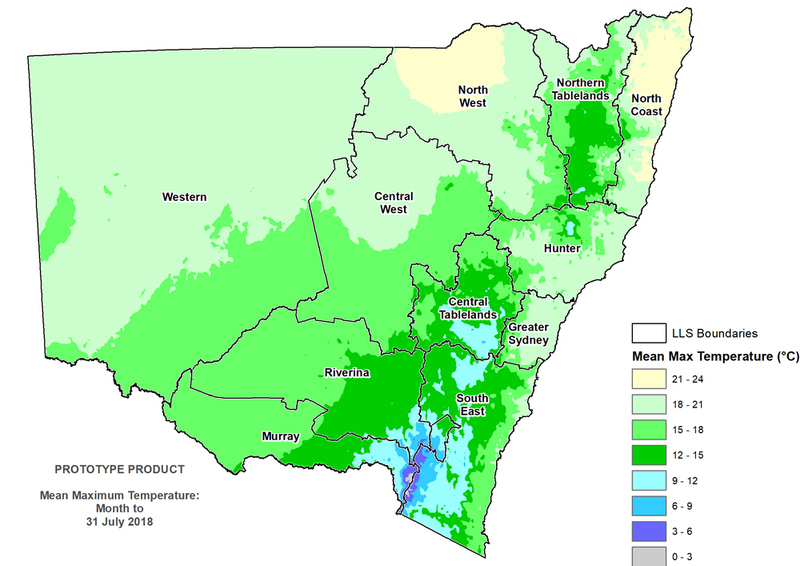 The majority of NSW has between a 20% to 40% chance of exceeding median rainfall. The temperature outlook (Figure 27 & Figure 28) indicates there is an increased chance of warmer than average daytime and overnight temperatures across NSW. The majority of the state has greater than an 80% chance of warmer than average daytime and overnight temperatures. Overall, global climate models (Table 1) favour a near-neutral outlook for rainfall for NSW during August to October. The temperature outlook favours generally warmer than normal conditions though two models suggest cooler than normal and three suggest near-neutral conditions. The El Niño Southern Oscillation (ENSO) remains neutral (as of 31 July 2018). Sea surface temperatures in the tropical Pacific have cooled slightly but remain warmer than average. More than half of the international climate model surveyed by the Bureau of Meteorology suggest warming in the tropical Pacific will recommence in the coming weeks, with El Niño conditions likely be achieved in the southern hemisphere spring. The Bureau of Meteorology’s Outlook remains at El Niño WATCH, with a 50% chance of an El Niño forming in spring. During an El Niño, rainfall in eastern Australia is typically below average during spring and daytime temperatures in southern Australia are typically warmer than average. 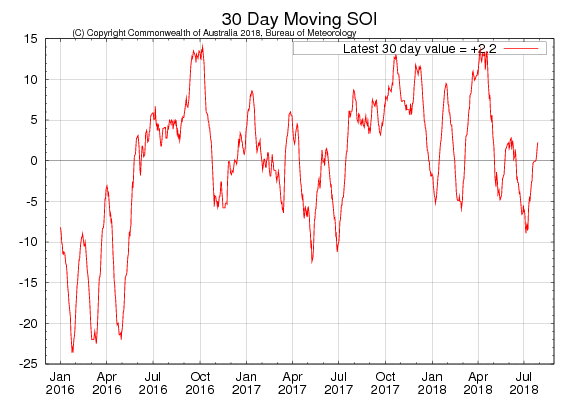 The 30-day SOI value (Figure 29) is currently within the neutral range (30-day value was +2.2, 90-day value was -0.4 as of 29 July 2018). Cloud levels at the junction of the equator and the International Date Line fluctuated around average during July, and have generally been below average since February. Trade winds are currently near average across much of the equatorial Pacific (as of 29 July 2018). Monthly sea surface temperatures anomalies (SST) for June (Figure 30) were slightly warmer across the equatorial Pacific although remains within the Bureau of Meteorology’s neutral range between -0.8 and +0.8 in the NINO3 and NINO3.4 regions. 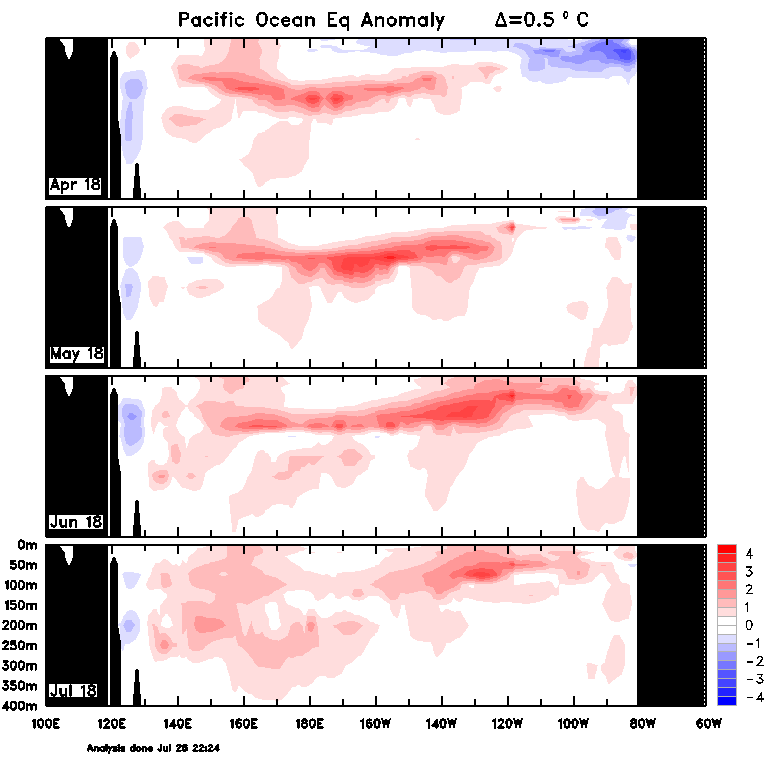 Anomalously warm sea surface temperatures are affecting a parts of the South Pacific. Sub-surface temperatures (Figure 31) show a pool of unusually warm water extending across the top 150m of the equatorial Pacific in June as well as July. While this is a precursor to development of an El Nino climate state, whether the warm water reaches the surfaces is subject to a number of factors, including the influence of trade winds in the region. The Indian Ocean Dipole (IOD) remains neutral (as of 31 July 2018). Three of the six international climate models surveyed by the Bureau of Meteorology predict that a positive IOD may develop, with a fourth model also close to reaching the threshold for a positive IOD. A positive IOD is associated with less moisture than normal in the atmosphere to the northwest of Australia, altering the pattern of weather systems and often resulting in less rainfall and higher than normal temperatures over parts of Australia during winter and spring (Bureau of Meteorology). The Southern Annular Mode (SAM) is currently at near neutral (as of 26 July 2018). Much of the information in the Seasonal Conditions Report is sourced from the NSW DPI Enhanced Drought Information System (EDIS) ™. The EDIS system is currently available in prototype form and is subject to an intensive ground truthing process. For more information, visit the interactive website via DroughtHub. The seasonal outlooks presented in this report are obtained from the Australian Bureau of Meteorology and other sources (including World Meteorological Organisation Global Producing Centres). These outlooks are general statements about the likelihood (chance) of (for example) exceeding the median rainfall or minimum or maximum temperatures. Such probability outlooks should not be used as categorical or definitive forecasts, but should be regarded as tools to assist in risk management and decision making. Changes in seasonal outlooks may have occurred since this report was released. Outlook information was up to date as at 4 June 2018. Disclaimer: The information contained in this publication is based on knowledge and understanding at the time of writing (August 2018). However, because of advances in knowledge, users are reminded of the need to ensure that information upon which they rely is up to date and to check currency of the information with the appropriate officer of the Department of Primary Industries or the user’s independent adviser.